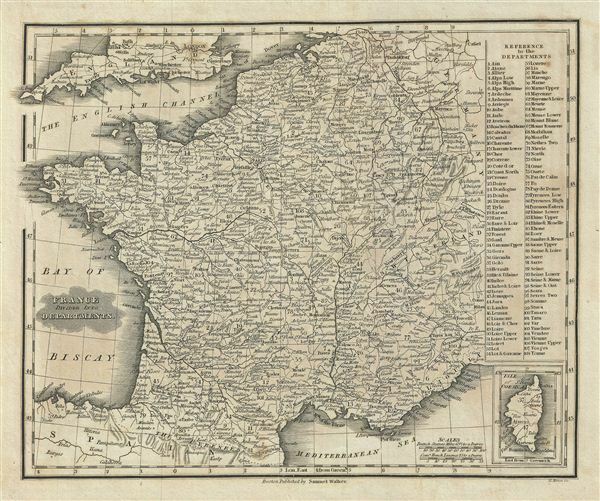 This is an attractive example of the 1828 Malte-Brun map of France, divided into Departments. The map covers all of France and is divided into 108 administrative departments. An inset in the lower right quadrant details the Isle of Corsica. A list of French Departments appears in the upper right quadrant. The French Department system was established on March 4th, 1790 by the National Constituent Assembly to replace the provinces with what the Assembly deemed a more rational political structure. The new department system was intended to deliberately break up France's historical regions in an attempt to erase cultural differences and build a more homogeneous nation. Initially there were 83 departments but by 1800 that number increased to roughly 130. This map details 108 of those departments. Many of the departments that were created in 1790 remain the administrative districts to this day. Various, important rivers, islands, cities and other topographical details are noted. This map was published by Samuel Walker in 1828 as part of the American edition of Conrad Malte-Brun's System of Geography, Vol. I. Very good. Blank on verso. Original platemark visible. Slight overall toning.